I'm on a mission to come up with more fresh outfit combinations using existing items in my closet. One thing I've learned when trying to use what I've got is to start with one piece and work my way around it. For instance, I decided that I wanted to wear these OTK boots. Taking that, the weather, the occasion, the destination and my mood - I build an outfit. By starting at one point I eliminate a lot of options, save time and I'm able to focus on being more creative with the rest of the ensemble. We headed out for a casual dinner with my friends to celebrate my birthday over the weekend. Because of the mild weather we've been having, we dined outdoors under the stars. I wanted to stay cozy without being all covered up so I reached for an over sized sweater and these boots. 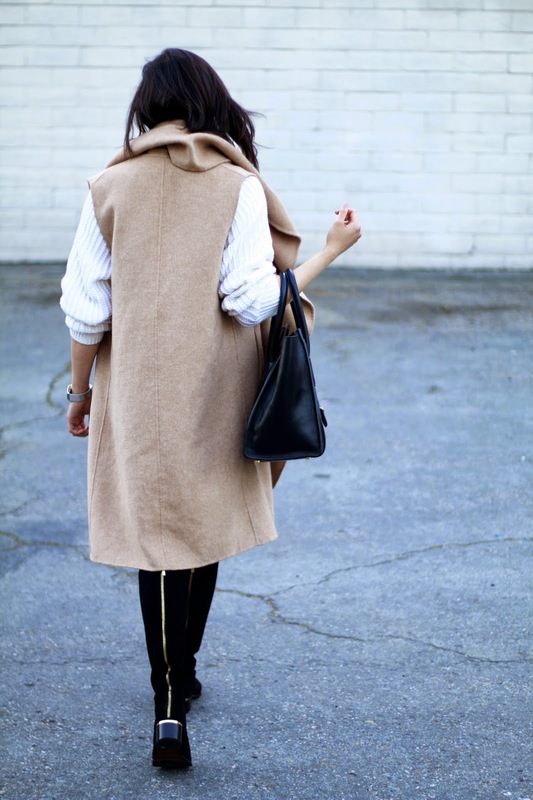 The sleeveless coat added an extra layer of warmth. I like how the coat's longer length let me show just a hint of leg and the low heel height of the boots lent a relaxed vibe. 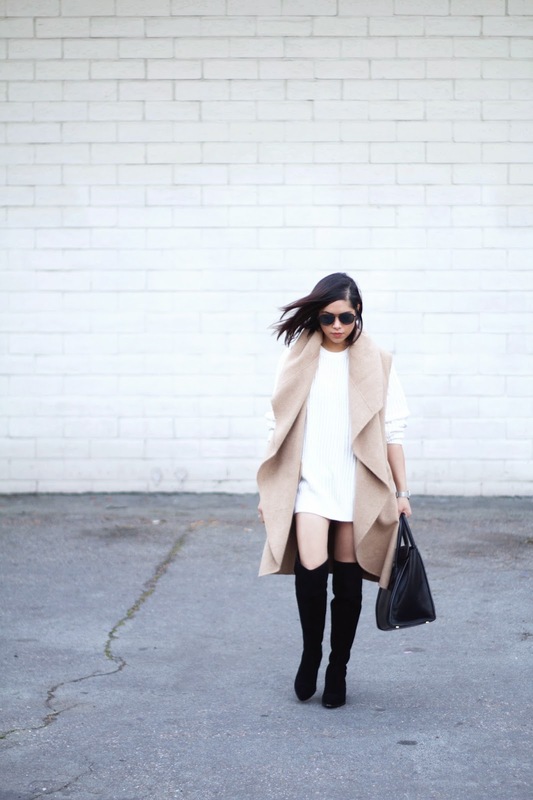 Over-the-knee boots can be tricky. The most flattering and wearable ones I've come across hit about an inch or two above the knee - the slimmer portion of the thighs. My calves are pretty small, so it was a bit tough finding a pair that didn't bunch around my ankles too much or scrunch down while I walk. These ones (older, purchased on major sale at Macy's) by Donald J Pliner fit the bill. Before I make any style investments, I always ask myself is it flattering and is it practical? What I love about this pair is how the low heel combined with the pointed toe subtly elongates the legs without sacrificing comfort. Do you have any boot-shopping and styling tips you swear by? Thanks for dropping by!